Malang city did have an amazing stretch in terms of motor modifications. Apparent when Djarum Black MOTODIFY early in the year 2009 was held in this city. Located at the Dome Universitas Muhammadiyah Malang (UMM), Saturday to Sunday (9-10/5), a fantastic treat it successfully served the modifikator city. Hyperkreasi the range shown, sticking a row of motor sport is no exception bertipikal Honda CBR 1000 Tiger faced. Not only a neat, all the detail curve Honda Tiger body has been designed to sepresisi may actually resemble the real face of Honda CBR 1000. 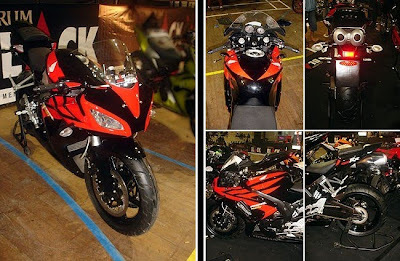 As the owner, Brenda Rest explain modifications of this bike, "Early concepts that I want to apply the adopted moge (motor gede) with basic motor fox Tiger I became CBR 1000 in 2006," he explained. More information about the reason to take the concept moge, this friendly guy explains, "I make this motor because the average moge in Indonesia were rare and even if there is expensive so I want to change the way moge finally achieved." The results are remarkable, given the look of the front, next to the contour of the back that looked fierce and so firmly. For the front legs are used supplies include usage fork upside down, following PSM KALIPER discs with Brembo brake master took Nissin brand. For the rear legs swing arm asupannya include a 1000 CBR dikastem, YSS suspension and fixed with Nissin disc brakes. For the body is known as fixed by the framework wrapped Tiger front CBR 1000 guise kastem. Not necessarily use the existing parts, some parts like the exhaust was designed handmade handmade aka Andi Rest yourself. Continue to the variation seen here intake Vario-style taillights and headlights left and right sign Vixion use models. With a racing-style Footstep of Yoshimura, the control wheel is also designed with solid handmade model. For myself finishing this bike was covered glose auto paint color Honda Fireblade adopted. About the overall process of this kindly man explained, "For a long time if the initial processing takes approximately 3 months but if we've got a bike so we can trim about one month." For the total cost of the process itself, Andi admitted that he had spent approximately USD 17 million. So confident of the other competitors in fact this bike is capable of providing maximum results. First prize in the Sport class Modif motor achieved this one. Andipun said about his success, "I am delighted to finally work for three months can be paid and for the future I will never cease to continue to innovate," he said, closing the conversation.